Trio Wine Beer Cheese in Kitty Hawk has changed its name to Trio Restaurant & Market. The business opened nearly eight years ago as a wine, beer, and cheese shop, with a bar serving a limited menu. Since then, it has evolved into a full-service restaurant and gourmet market. The name change was made to better reflect the business’s current offerings. 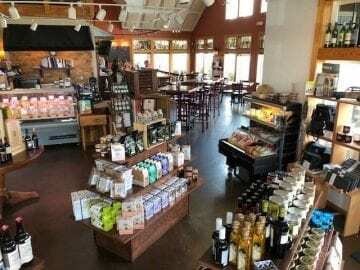 “When we originally opened, our goal was to provide the best selection of wines, beers, and cheeses on the Outer Banks in both our retail shop and in our bar,” said Kenneth Hyman, a partner in the business. “Our first menu was just a couple of salads and sandwiches, cheese plates, and a few snacks,” said Jennifer Minnich, another partner who ran Trio’s kitchen when they first opened. Last summer Trio underwent a substantial kitchen expansion. Since then, current chef Emily Cohill has expanded the menu significantly. The restaurant still serves salads, Panini, and small plates, but now offers a heartier fare and regional favorites like seafood pot pie, shrimp & grits, meatloaf, and more. They’re also launching a series of lunch and dinner specials in the restaurant over the coming weeks. The retail side of the business has experienced a similar transformation. Not anymore. Trio’s market has expanded to carry grocery selections, craft mixers, local products, and house-made prepared foods. With the recent addition of an imported flywheel slicer, they’re also able to offer prosciutto, salamis, and other cured meats cut to order. Plans are in the works for heat-and-eat meals, as well as grab-n-go salad and sandwich options. Despite the name change, customers can still expect to see familiar products in the market and favorite dishes in the restaurant. “We’ll still have all the things our customers already love, but they’ll also find we have more of what they want,” says Hyman. Trio is located at milepost 4 ½ on the bypass in Kitty Hawk. They’re open seven days a week, serving lunch, dinner and weekend brunch all year round.